Moving to the country has opened up such a range of possibilities that our former life within the confines of an HOA would not allow. One of those things is beekeeping. We'd discussed the possibility and were thrilled to discover there is a Beekeeping Association in our new county. This weekend they hosted an introduction to beekeeping, and we were able to learn the fundamentals of starting our own apiary and harvesting honey! There were more than 50 other beekeepers-in-training in attendance, which is a good sign for the dwindling honeybee population. We want bees not only for their honey, but to pollinate the fruit trees and garden we plan to plant. In addition to video and power point presentations, we were able to go around to stations to see hands-on how the equipment works and speak to experienced local beekeepers. It was a great experience and really got us excited to get our hives set up as soon as possible so we might have honey by summer. We learned different methods of feeding bees sugar water. We learned how to build the brood boxes, supers and frames that make up the hive. Our kiddo was especially fascinated by the hammering involved in hive building. We learned how to use a smoker to calm the bees. Finally, we learned how to extract the honey from the comb. At the end of the class,they held a raffle to give away the beehives we'd built in the class, along with a swarm of bees to populate the hive and some necessary accessories. Lo and behold - WE WON! We planned to start off with two hives, so still need to supplement our winnings with another setup, but what a good omen to our fledgling beekeeping endeavor! Last week I signed up to bring a treat to my toddler’s day care Valentine’s Day party. The only other thing listed on the sign-up sheet was cupcakes, so I thought I’d bring something savory. But what to bring. I was browsing pinterest and saw a cute craft where you shape a toilet paper roll into a heart and use it as a stamp. This sparked an idea. 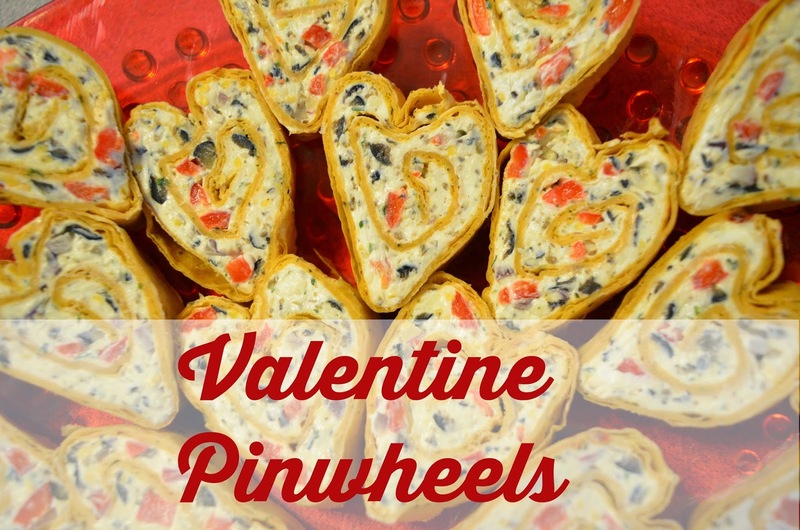 I made cream cheese pinwheels for the KLAW’s first birthday… I wondered if I could shape them in to hearts. Turns out, I could – they looked super cute and were quite tasty! I modified the original recipe to make it a little more red and valentines-ish. Here is the recipe. It wasn't a hit with all the toddlers, but you could modify the mix-ins to suit your audience’s taste. It takes less than 30 minutes to prepare the night before your event, then another 15 minutes or less to slice them up the day-of. This recipe makes 40 pinwheels. Mix the ranch dressing mix into the cream cheese, then fold in the pepper, onion, olives and cheese. Spread the mixture on the tortillas. You can go easy on spreading the mixture on the two sides that become the open ends of the roll because you will slice them off. Once they are rolled, form the hearts. Pinch one side to form a point, along the roll, to form the bottom of the heart. Opposite the point, use the dull end of a butter knife to press in a divot along the roll to form the top part of the heart. Wrap each tube Tootsie Roll style in waxed paper. Refrigerate overnight to allow the ranch flavors to fully come out. In the morning, using a serrated knife to gently saw the roll so as not to smoosh it, cut the ends off the rolls, and then slice each tube into approximately 10 slices (about ¾”-1" each). You can pinch the slices to make them a little more heart-shaped if they look wonky. Arrange on a plate and serve!